This National Day of Prayer is to honour the children lost to and the adult survivors of residential schools. The Federal Government is currently withholding documents pertaining to the residential schools in Canada. We are calling on the Government of Canada to IMMEDIATELY release the documents as ordered by the Court. In 2008 Canada apologized to residential school students – they need to honour it. We are asking everyone to personally ask the Government of Canada to release these documents so that these children are honoured and their stories are heard. 12:00 – Assemble on Victoria Island. Welcoming address by Claudette Commanda. 12:05 – Prayer by Elder Thomas Louttit. 12:10 – Words from youth Lysandra Chaplin, mother and intergenerational survivor Geraldine King, survivor of Fort Albany Residential School Linda Kooses. We are asking everyone to create a personal request and deliver it to the Head Office of Aboriginal Affairs and Northern Development Canada in Gatineau. 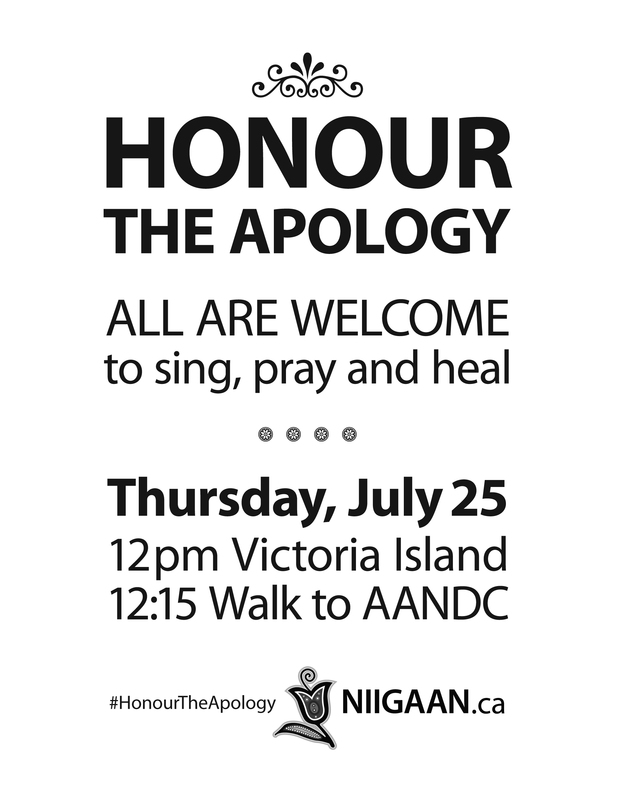 The signs and personal requests will be placed in front of the AANDC building. – Justice for the children that remain in care today. We will be creating a visual representation of the personal impact from the federal government’s refusal to release the documents to the Truth and Reconciliation Commission and demand open access to the true history of the residential schools. Spread the message and get involved. These posters are sized to print on 8.5″ x 11″ letter-size paper. We need volunteers! This is a grassroots-driven effort to honour the brave children that went to residential schools, the survivors and their families, the children that are in state care today, and to work towards a brighter future for the next seven generations. We don’t have a lot of time to coordinate, but with many hands we can ensure the rally goes smoothly. Please email niigaan@gmail.com with how you can help or any suggestions. Chi-miigwech!